Fortnite Battle Royale for iOS has just been unleashed! The only the beta version of the game has been released, you can sign up for the epic account to have a go at this fun and exciting game. I have just installed this game on my iOS device and I am already exploring it endlessly. 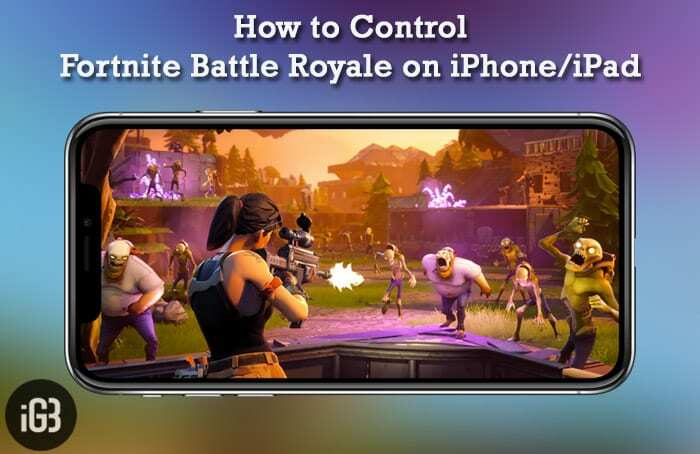 As expected, controlling Fortnite Battle Royale on iPhone or iPad is very simple and its all thanks to the interactive gestures. Have you also gotten this amazing multiplayer game? Let us head over to discover ways to get the most out of Fortnite Battle Royale so that you will always remain a step ahead of your rivals! With the use of Crouch, you can hide your character behind cover. This will help prevent other players from seeing your character. To do so, simply press the crouch button at the top right corner of the screen. When playing the game, you can use jumps to cleverly get past hurdles and obstacles. You can also use it to climb structures with ease. Press the jump button on the right side of the screen to jump. You should use the on-screen joystick at the bottom left corner of the screen. You can use it to move your character around in the game. Simply press your finger down on the joystick and slide the joystick around in the direction you want to move. To pick up items with your character in Fortnite Battle Royale, you just need to tap on the item you want to pick up. The items you have gathered will appear in a row of icons at the bottom of the screen. To select any of these items or weapons, simply tap on the one you want to select. There are two ways you can use to attack, fire or use items in Fortnite Battle Royale. You can either tap on the attack button on the left side of the screen or tap anywhere on the screen. While playing Fortnite, if the weapon you are using runs out of steam, you can easily reload it. To reload your weapon, simply tap on the reload button above the items along the bottom of the screen. You can easily access your playback in Fortnite. Simply tap on the backpack button at the bottom of the screen. To build a structure in the game, you need to access the building menu. Simply tap on the building button on the right side of your inventory icons. Once you have fully equipped and are ready to fire a deadly shot, simply tap on the aim button on the right side of the screen. Go to the build menu to build a structure by tapping on the building button on the right side of your inventory icons. Next, tap on the screen to switch between wooden, metal, and brick buildings and then choose the type of structure you wish to create. Once you have chosen the structure, you need to move it to any position you want. When you are done, tap on the screen to complete the building process. So, you have found your prey. Aim accurately to gun your prey down. In order to aim or look around your environment, you need to drag your finger around the right side of the screen. Make the most out of these cool tips listed above to make your gaming much more interesting. If you discover any new stuff, make sure to share them with us. So mobile get an advantage in cross play. how about stop being babies and buy a pc or console. if your gonna to give them help by pointing to where people are then its not the same game and personally think it shouldn’t be cross play due to that.